Simply put, caviar is any single salted fish roe or egg. In the United States, as long as the species of the fish precedes the word "caviar", it is considered caviar. TRUE caviar comes from the icy waters of the Caspian Sea where the environment is most conducive to producing the finest sturgeon. 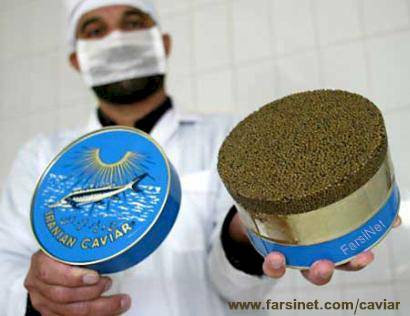 Ninety percent of the caviar produced in the world comes from the Caspian Sea. Sturgeons have an unerring survival instinct. These bottom-dwellers with their sensitive barbels and pouted snouts have existed for millennia. Even to this day, relatives of the sturgeon live in the black depths of the ocean, in subterranean watercourses, even in hot springs. Sturgeons are scaleless except for five rows of large, pointed, platelike scales running along the top and sides of the body. Their exoskeleton is part bone and part cartilage, placing them midway between sharks and bony fish. They can live for 100 years, and reach maturity between 12 and 20 years of age. Sturgeons are anadromous, living as adults in marine waters but returning to freshwater rivers and streams to breed. There are almost 20 different types of sturgeon, two of them belong to the genus Huso, the others are of the genus Acipenser. Six of them live in the Caspian Sea, only three sturgeon species produce this exquisite caviar: Beluga, Asetra, and Sevruga yielding over 90% of the world's total production. It can be said that caviar is actually good for you. Through chemical analysis it has been revealed that caviar does contain 47 vitamins and minerals. There are 68 grams of fat in a pound (16 ounces) of caviar, consisting of 25% cholesterol and 75% lecithin. There are only 74 calories in an ounce or 1,188 calories in a pound of caviar. For centuries caviar has been considered an aphrodisiac because fish and their by-products have been linked to the myth of Aphrodite, the Goddess of Love, who was born from the foam of the sea. No wonder there is so much mystery, legend, magic and romance connected with caviar. Why is Beluga so much more expensive? Is it the best? The species Beluga is the rarest of the Caspian Sea sturgeon. It takes this species at least 20 years to mature before producing eggs. No Caspian sturgeon is considered superior to another; the caviar of each species is prized and preferred for its individual characteristics. Situation and access: Region of Gilan. Large port on the Caspian Sea. Altitude - 20 meters. 380 Km N-W of Tehran via Qazvin and Rasht, on a very good road or 430 Km via Chalus on a good twisting road. You can drive your car across the beach, which shows that the sand there is hard and pure. In a pleasant and relaxed atmosphere its inhabitants and seamen on shore-leave stroll during the evenings and during the whole of Friday in the public garden which follows the coast road on the right bank of the channel linking Anzali Lake to the sea. When you become tired of walking, you can sit down on a small wooden stool, have a cup of burning-hot tea (Chai) and nibble pounds of pistachios while watching the boatmen wielding with calculated slowness the oars of their gaily coloured craft. Bandar-e Anzali is the capital of Caviar. The preparation and marketing of the precious black eggs is a state monopoly, handled through "The Iranian Fishing Company" coming under the Finance Ministry. The public is not admitted to the immense refrigerated hangers (-18 degrees centigrade) where tons of Sturgeons, monsters between 2 and 3 meters long weighing between 75 and 100 Kilograms (the record is a 850 Kg sturgeons) are stored after removal of caviar, usually equivalent to about one tenth of their weight. Nor is it easy to approach the fishing boats or equipment. Proper Iranian Caviar Serving Suggestions? Remove the caviar from the refrigerator 15 minutes before serving. The lid should be removed at the last moment. The ideal presentation is to offer the whole tin on a bed of crushed ice, carefully so as not to break the grain. It should be spooned onto a chilled plate. You can serve caviar with pieces of bread that have been lightly toasted (to preserve softness) and then quickly spread with butter. Above all, never sprinkle the caviar with lemon or serve garnished with chopped egg, onion, or sour cream as they alter the taste and distract from the pure flavor of caviar. These condiments should be saved for other less expensive grades of caviar. It is a matter of personal taste whether you drink champagne or other spirits with caviar. Many people swallow caviar whole, but to fully appreciate the flavor you should "break" the eggs with the tip of your tongue against your palate in order to savor the flavor in your mouth. Unopened, a container of fresh caviar may be kept in the refrigerator for up to 4 weeks. Once it is opened, it is highly perishable and should be eaten right away. Never keep caviar in a freezer. Caviars are available pasteurized or fresh. Pasteurization processing kills bacteria and fungi and therefore caviar can be stored a period of time. Caviar should always be stored at 28 degrees to 32 degrees. True caviar can be held unopened under refrigeration for four weeks. Pasteurized caviars will keep in the refrigerator unopened for several months. Once opened, all caviars should be consumed within two to three days. What is the future of Caviar? There is fear among experts and local fishermen around Caspian Sea that over fishing, oil pollution and other industrial hazard material and pollution are having a great negative impact on Caviar. Some fishermen believe they are the last generation of caviar fishermen. How much does the Iranian Caviar cost? For upto date price of the Iranian Caviar visit ezcaviar.com. It is said that the first people tasting roes were the Azeris and Persians living at the Kura River on the area of the former Persian Empire, (today Azerbaijan). They called them .Chav - Jar. which means a cake of power. The Persians believed that caviar was a medicine, which can cure many diseases, and also a source of energy. Aristotle, the Greek scholar in the 4th century B.C., described caviar as a delicacy made from the roe (eggs) of sturgeon fish. During the Roman Empire, caviar was such a luxury so that it was presented among garlands of flowers, and trumpets heralded its arrival to the table. The main consumers of caviar in old Russia were the czars during the Russian Empire. Every year Czar Nicholas II received 11 tones of the best caviar as an annual tax from the fishermen of Astrakhan and Azerbaijan (Azerbaijan became a part of the Russian Empire after the Russian - Persian war and now an independent country after Soviet Union collapsed in 1990). In the second century B.C., a jar of sturgeon had a value equal to 100 sheep. Caviar was not always as expensive as it is today. At the turn of the 20th century it was offered in pubs and bars throughout the US, just as peanuts are today. Historical sources say that 1 kg (2.1 LBS) of French caviar cost less than 20 cents in 1899. Just before World War I the same kilogram of caviar could be bought for 40 cents, slightly higher than the cost of bread. Today true caviar is still among the most expensive and exclusive of all preserved foods for a number of reasons: the scarcity caused by over-fishing and pollution, the labor-intensive processing, and its extreme perishability. Another reason for its expense is directly related to the age and size a sturgeon must reach before it develops its valuable roe. Various sources insisted that even though beluga varieties were the most expensive, they didn't always taste the best. Beluga sturgeon are up to 20 feet long and can weigh as much as 2,000 pounds. Their eggs are larger than those of other sturgeon, which explains why a jar of beluga (2 ozs) caviar smaller than a can of tuna runs about $120. This price should be less than the cost of 100 sheep. Today U.S. accounts for about 80% of the world's beluga market. In France, laws state that only processed roe of sturgeon can be called caviar. In the US, however, various kinds of fish roe can be sold as caviar as long as the fish type must be indicated on the label. The major sturgeon species used to produce true caviar today are Beluga, Osetra and Sevruga. Sturgeon, which is nearly extinct, was the source of the prized "golden caviar of the Czars" which got its name from its golden color. Caviar is graded by color and size, with the lightest and largest being the best and therefore the most expansive. The sturgeon eggs are graded for color, with 000 indicating the lightest colored and 0 the darkest. The US and other countries also produce caviar from the roe of salmon, paddlefish, whitefish and lumpfish. Each type has different standard and price is much lower than .true. caviar.